In the summer hotel rates are at their lowest, and there’re plenty to do indoors and out. Even in the heat and humidity, we are happily eating, drinking, dancing, mingling, strutting, and even running. From brass bands to block parties to parades to running in a fancy dress (or from the New Orleans version of “the bulls”) there’s something going on every weekend. Here’s what you shouldn’t miss if you’re in New Orleans this summer. Start off with a lovely, smaller French Market Creole Tomato Festival (June 9-10) that celebrates the arrival of the beloved Creole tomato. In its 32nd year, the free festival will again feature two live music stages, a cooking demo stage, kid’s activities, and the return of Bloody Mary Market in Dutch Alley. 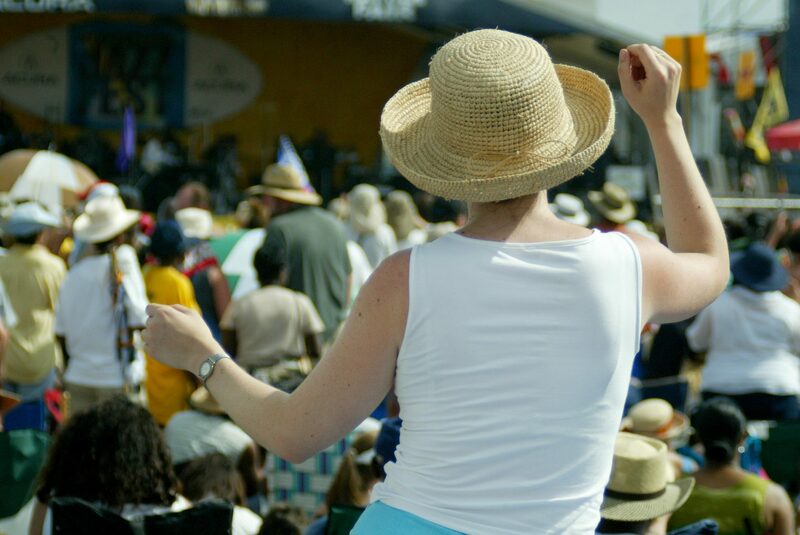 Produced and presented by the New Orleans Jazz & Heritage Foundation, the free Louisiana Cajun-Zydeco Festival (June 24–25) features top Cajun and Zydeco musicians from New Orleans and Acadiana on two stages at the Louis Armstrong Park, plus a big arts market, cooking demos, and numerous food options from local vendors, with emphasis on Cajun and Creole food. This year, the newly crowned Grammy winners The Lost Bayou Ramblers will headline along with the Grammy nominee Dwayne Dopsie & the Zydeco Hellraisers. This year’s Independence Day weekend is shaping up to be spectacular, paying special tribute to the city’s tricentennial. As usual, it will be filled with special events, fireworks, and — this being New Orleans — great food and music. Kick off the festivities with Go 4th on the River celebration, a free Dueling Barges fireworks show over the Mississippi River at the Riverfront. Gear up for the best in R&B, hip-hop, jazz, and blues with Essence Festival (July 5-8), held at the Mercedes-Benz Superdome. The always-impressive music lineup this year includes Janet Jackson, Mary J. Blige, The Roots, Erykah Badu, and Jill Scott. The fest offers a packed schedule of seminars and celebrity DJ parties, while the areas in and around the Superdome will again host temporary arts and crafts markets. New Orleans’ own Big Freedia will headline a special celebration of New Orleans Bounce, also featuring DJ Jubilee. Running of the Bulls brings Encierro to New Orleans on Saturday, July 14, except the bulls are the Big Easy Rollergirls. San Fermin in Nueva Orleans pays annual homage to the world-famous Encierro of Pamplona, Spain, running through the French Quarter. Celebrate the French National Day in America’s most French city during the annual Bastille Day Fete (also on Saturday, July 14), a block party in the 3100 block of Ponce de Leon Street in the city’s historic Faubourg St. John neighborhood, adjacent to Esplanade Avenue. Live music and kid-friendly events abound, while dozens of local vendors present their food and drinks, many with a French flavor. Some of the best restaurants and bars in town celebrate Tales of the Cocktail on July 17-22. Since 2002 the festival has grown from an annual walking tour of historic New Orleans cocktail bars into a series of parties, tastings, seminars, and more. This year will be its 16th, and will feature special events planned to honor the tricentennial. Satchmo SummerFest (August 3-5), named so after one of Louis Armstrong’s nicknames, started as a tribute in 2001, on Armstrong’s 100th birthday. It has been traditionally held on the first week of August and marked by strong attendance. The three-day festival is held at the U.S. Mint at the foot of Esplanade Avenue., and will have music all weekend on its two outdoor, tented stages. Other events will include a Sunday morning Jazz Mass at the historic St. Augustine Church in Treme, seminars and film screenings, kid’s activities, and a second-line parade. Browse the galleries on the White Linen Night on Sunday, August 5 (or its cheeky cousin, the Dirty Linen Night). White Linen Night is a block party and an open house for galleries on the 300-700 blocks of Julia Street in the Warehouse District, with three stages for live music and dozens of food and drink stands. About 20 galleries on and around Julia St. will be open to the public, with an after-party traditionally held at the Contemporary Arts Center. The Dirty Linen Night (Saturday, August 11) usually follows the White Linen Night on the second Saturday in August. It’s similar in format, though looser in structure and spanning more territory. Although Dirty Linen Night does riff off White Linen Night, it wasn’t created to compete with the Warehouse District event but to promote the many galleries and shops of Royal Street. The multi-block party takes over the 200-1000 blocks of Royal Street and some cross streets and adjoining areas in the French Quarter, including Jackson Square and Dutch Alley. About 40 galleries are expected to participate again this year, plus a number of shops and restaurants. The Red Dress Run (also on Saturday, August 11) isn’t exclusive to New Orleans, but the local participants take it up a notch by costuming on top of wearing their best and/or most outlandish red dress, regardless of gender. This is an annual fundraiser run for local charities organized by hashing groups (adults-only, non-competitive social running clubs) all over the world. They call themselves “drinking clubs with a running problem” and the local group is no exception. Any adult can participate with registration, and the run traditionally starts at Crescent Park, though the route will not be publicized until the day of the run. The incomparable Southern Decadence festival (August 20 – September 3) is traditionally held on the Labor Day weekend. It started as a going-away party in the early 70s but now considered the fifth largest event in New Orleans. This massive four-day festival celebrates LGBT culture and attracts participants from all over the world. Just like every year, most activities will be centered in and around the French Quarter, with lots of block parties and dance parties at bars and clubs on Bourbon Street, plus two parades. There’s no better time to try out an award-winning restaurant or revisit the old favorite than August, thanks to the annual COOLinary program. COOLinary is orchestrated by the New Orleans Convention and Visitors Bureau and was conceived as a promotion to lure diners to local restaurants during the slowest summer month with discounted dining deals. This year, the deals follow the same format as in the previous years: the prix fixe three-course dinner and brunch menus don’t go over $40, and the two- to three-course lunch menus don’t exceed $20. Over 100 restaurants are expected to participate.